The PATH environment variable is in general a list of directories that the operating system will search through when programs attempt to execute a command. For example, say we go into the windows command prompt or Ubuntu’s bash shell and type in “foobar” – the operating system will attempt to locate an executable (program) named “foobar” in the folders listed in the PATH. Replace “foobar” with “python” or “django-admin.py” and you start to understand why this is useful. How do we set the PATH? Push the windows button and type “environment variable” on the search bar and select “Edit environment variables for your account”. Non Vista/Windows 7 users just right click on My Computer, go to Properties, click Advanced Properties, then the Environment Variables button to get to the same place. 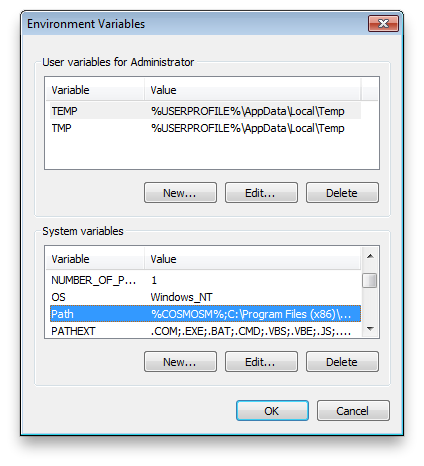 In the Environment Variables screen, look for the “Path” variable under the “System Variables” section on the bottom. If it doesn’t exist, just make a new one. Do not delete the default path – append to it. Pingback: Python on Windows — Running Python.exe From Command Prompt « The Great Magnet. What a fool I was to defy him. Thank you Yuji, I was looking for a way to do this. I tried this but it doesn’t work.Can any one help me ? Yeah, if you add the parent directory to the PATH, and restart cmd, typing python should launch python.exe. Did you restart? Anyone interested in modifying the PATH or any other environment variable in Windows should check out “Rapid Environment Editor”. I did that but It is showing an error! but when I set my command prompt to python dir .. its working! Thank you very much in explaining how to append Path. I didnt know I can set up multiple paths. That helps my Python and Django installations now. Cheers!!! The path needs to be set to the directory of any executable scripts you want access to from the command line. Say you have a script foo.py – if you put the directory it’s in into the path, then you can execute foo from any command line. If you can’t edit it – then that’s a different problem. Do you need admin rights or something? I had the same problem, but there’s another way to get there. On your desktop, right-click My Computer. (If you don’t have that icon on your desktop, go to the Desktop via Windows Explorer.) Select Properties. Then click Advanced System Settings on the left, and then click the Environment Variables button at the bottom. Hopefully you’ve figured all that out by now, and this comment will just be useful to the next person to come along. Thank you! Works like charm! I did need to close the cmd and re-open it! This is exactly what I was looking for, however I can’t access my system variables, only the user variables (I have an admin account on my windows 7). Anybody got an idea why? And how I can get access?